The beautiful Bodrum Peninsula suits holidaymakers interested in a subdued and relaxing atmosphere. Enchanting villages, with guest-houses and small hotels on quiet bays, dot the peninsula. On the southern coast, Bardakçi, Gümbet, Bitez, Ortakent Yalisi, Karaincir, Bagla and Akyarlar have fine, sandy beaches. Campers and wind-surfers enjoy Gümbet, and at Bitez colorful sail boards weave skillfully among the masts of yachts in the bay. On shore you can enjoy quiet walks through the orange and tangerine groves bordering the beach. Ortakent has one of the longest stretches of sandy beach in the area and offers an ideal place for relaxing in solitude. One of the most beautiful beaches on the Bodrum peninsula, Karaincir, is ideal for lively active days by the sea and relaxed, leisurely evenings with local villagers. Finally, Akyarlar enjoys a well-deserved reputation for the fine, powdery sand of its beach. Turgutreis, Gümüslük and Yalikavak, all with excellent beaches, lie on the western side of the peninsula and are ideal for swimming, sunbathing and water sports. In Turgutreis, the birthplace of a great Turkish admiral of the same name, you will find a monument honoring him. In the ancient port of Myndos, Gümüslük, you can easily make many friends with the hospitable and out-going local population. In Yalikavak white-washed houses with cascading bougainvillaea line narrow streets. Small cafes and the occasional windmill create a picturesque setting. See the north coast of the peninsula - Torba, Türkbükü, Gölköy and Gündogan - by road or, even better, hire a boat and crew to explore the quiet coves, citrus groves and wooded islands. Little windmills which still provide the energy to grind grain crown hills covered with olive trees. Torba, a modern village with holiday villas and a nice marina is located 8 km north of Bodrum. Gölköy and Türkbükü are small and simple fishing villages with a handful of taverns overlooking a lovely bay. The Gulf of Güllük, and harbour of the same name, lie north of the Bodrum peninsula on the Aegean. The mythological Dolphin Boy is said to have been born a little farther to the north at Kiyikislacik (lassos). South of Güllük, Varvil, ancient Bargilya, sits at the end of a deep narrow inlet surrounded by olivve covered hillsides. Inland from Güllük is Milas, ancient Mylasa, known for its beautiful carpets - a century old tradition which continues to the present day. The weavers rarely mind a visitor watching them at work. Plenty of old Turkish houses with carved timbers and latticed windows provide examples of the vernacular architectural style. Gümüskesen, a monumental tomb, thought to be a small copy of the famous Halicarnassus Mausoleum, stands in the west of the city. The ancients built Labranda, a sanctuary dedicated to Zeus, high in the mountains. Today tourists have re-discovered this mountain retreat and escape to its exhilarating air and breathtaking scenery. Situated on a bay, backed by rugged pine-clad mountains, Marmaris is one of the most attractive maritime parklands, ideal for water sports and sailing. It makes an excellent starting point for the "Blue Voyage" tour of the Aegean coastline. In May the Marmaris Yacht Charter Show provides an opportunity to meet the yachts' captains and crews. With plenty of provisions aboard you set sail in the craft of your choice and languidly explore the spectacular beauty of southern Turkey. Mugla is the ideal destination for those who want everything at once. It is one of the most ancient cities of the Caria region. The most beautiful holiday resorts of Bodrum, Marmaris, Datca, Koycegiz and the like, are all within the borders of Mugla province. There are many quality holiday villages, comfortable hotels and hospitable guest houses Mugla and here you may enjoy every type of holiday, except for winter sports. The landscape is perfectly mingled with dozens of historical sites bearing the traces of past civilizations. The beaches are available for every water-sport, as unspoiled bays and clear waters await you in Mugla. In the city center there are picturesque views with the traditional Turkish houses and an Aegean type of living. The international airport of Dalaman (a town of Mugla) is the only one in the region. Lying on the south coast of the Bodrum peninsula, the Gulf of Gokova is a fascinating corner of Turkey, offering lovely views with charming combinations of colors. Pretty shorelines covered with woodland offer every tone of green, while the sea is a wide range of blues. The mountains shelter the setting sun under hues of red and yellow. If you would like to witness all these beauties, there are opportunities to take a yacht tour along these coastlines, and a boat trip on this gulf will make your holiday as beautiful as the place itself. A picturesque town at the junction of the Aegean and the Mediterranean is Bodrum, occupying a small but beautiful peninsula. It is one of the prettiest holiday resorts of Turkey, popular and famous for its vivacious, friendly and bohemian atmosphere. Greeting its visitors with the marvelous castle built by the Knights of Rhodes, the town appears elegant, filled with sweet white houses, with colorful bougainvillaeas dotted about. The clear, deep blue warm sea is an inherent characteristic of the place, rather than being a specialty, and the numerous beaches of unspoiled bays adorned with interesting rock formations offer perfect days for swimmers, divers and nature-lover. Octopuses, and sponges of various shapes and colors are also found here, complementing the aquatic beauty. Labranda, close to Milas, is a site of the worship of Zeus. Ancient people must have chosen this spot in the high mountains as the closest place to Zeus, the God of the skies. These exhilarating, high peaks are now rediscovered for an escape and offer fascinating scenery. Three pretty villages close to Bodrum, and Iying on the western end of the peninsula are Gümüslük, Turgutreis, and Yalikavak. Though all of them offer perfect opportunities for swimming, sunbathing and water sports with their lovely beaches by the clear blue sea, each has a distinguished beauty of its own possessing distinct natural and environmental beauties. 27 kms to Bodrum in Gümüslük lie the ruins of ancient Myndos, which was once an important Persian port. The city walls here contribute to the attractive atmosphere of the region, and the district is a peaceful and lovely one with hospitable locals. Turgutreis, extending to the south of Gümüslük, has taken its name from the famous Turkish admiral who was born here, and he was further honored with a monument. This village is one of the most active places in Bodrum, with numerous facilities for accommodation, entertainment and sports. Yalikavak is another pretty site, with its picturesque appearance of bougainvillea-covered white houses along the typical tiny streets, while interesting windmills adorn the land behind, providing extraordinary sights. With the Gökova Gulf to its north and the Hisarönü Gulf to the south, Datça is situated on a tiny peninsula with charming scenery. Extending towards the wide deep blue sea, this land offers a picturesque panorama, and refreshing air with no humidity. Here golden beaches join the green forests lying along the coastline, and gently surround the little town of white houses covered with bougainvillea. This delightful holiday resort welcomes the visitor with many facilities for a perfect vacation. For the campers, there are numerous spots from which to choose while comfortable villages are present for people who would like to "take things easy". The marina on the northern bay hosts many visiting yachts while the bars, cafes and boutiques here, please the "strollers". At nearby restaurants, one may find classic Turkish dishes, delicious and world-famous, while the discos offer memorable nights under glittering lights. 38 kms from Datça at the end of the peninsula is the Carian city of Knidos, which it is said, was built for the most beautiful Goddess, Aphrodite, on this most beautiful peninsula. There are two harbors, one on the Mediterranean Sea and the other on the Aegean Sea. Knidos was famous in the 4th- century BC as a center of art and culture. Today the city houses the remains of a circular temple dedicated to Aphrodite and an arcade with interesting marble heart-shaped columns. Fethiye is one of the most popular resorts due to its extreme loveliness. Set on a way wide bay, strewn with many islands. Fethiye is 135 kms southwest of Marmaris and has an outstanding and busy marina. The ancient name of the city is Telmessos and you will see a fortress on the hill overlooking the city which was built by Knights of Rhodes. Fethiye is known for its rock tombs carved into the faces of the cliffs by the Lycians. These are elaborately carved and an especially remarkable; one is the tomb of Amnytas dating from the 4th-century BC built in Doric architectural style. It is worth well visiting. Other historical places in the city are the Sarcopaghi and the Fethiye Tower. The Beach and the Sovalye Island are real the destinations for those who like to enjoy the most beautiful sea. Belcegiz Bay is also good for such a visit and provides natural mountain scenery. The guest houses here, will give you all the comfort you expect. The bay forms the dreamlike Belcegiz - Ölüdeniz (Blue Lagoon) known as "the paradise God granted to Earth", a very fine place with 3 kms of natural beach and crystal blue waters in enchanting surroundings. For camping, Belcegiz Beach is ideal and for picnicking try the Kidiril Park, for sightseeing the Gemiler Islands with their Byzantine ruins among the pine trees are recommenced. At Koturumsu, a heaven like beauty awaits you, where you may reach only by boat. There are waterfalls flowing across valleys where thousands of butterflies, exhibiting tremendous shades of colors, fly amongst the pine forest bordering of the lovely beach. Some of the other natural attraction are Katranci Bay, Gunluk (Kusuk Kargi) Bay, Oyuktepe, Gocek with its harbor and marina. Around Fethiye, there are important ancient cities of the Lycians. To the southeast of Fethiye lies Xanthos at Kinik village, an important capital of Lycians. Its setting is naturally adorned while Letoon, by Kumluova village and close to Xanthos, is also interesting. Letoon was a cult center during the Lycian period and remains can be seen of temples dedicated to Leto, Artemis and Apollo. Patara by Ovagelmis,s, Pinara by Minare, Tlos by Doger, Cadianda by Yesil Uzomlu, Sidyma by Dodurga, Karmilassos by Kaya, Pydnai by Kavadere, Araxa by Oren, Lydoe by Kapidag, Lissa and Arsada by Kayadibi, and Daedela by Inlice are other significant sites to visit in the environs of Fethiye. There are also many camping and picnicking facilities around Fethiye. Possessing the most special gifts of nature and history, Köycegiz stands beside the same named lake a tip of which touches the Mediterranean. Now a nature and wild life preserve, this site is a real paradise with its rare and beautiful setting, and with a history going back to 3500 BC. It is possible to cruise over the natural labyrinth-like channel, walled with reeds, that link sea and Lake Koycegiz, which is described as "smooth as glass" till noon and suitable for wind-surfing in the afternoon; it contains almost every kind of seafood including carp and crab, Dalyan can be reached at the end of a road decorated with scented frankincense trees. The Dalyan Delta is a unique site, lying peacefully with its golden beach. Sea turtles of Caretta, and blue crabs live here making the area more attractive. On the other side of the channel is the marvelous view of the ancient city Caunos, which was situated on the border between Caria and Lycia and a most important sea-port. The first sight here, is the unique and fascinating tombs carved into the rock and overlooking the waterway. 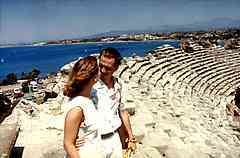 Also of interest in this district is the acropolis lying a litte inland, together with a Roman temple, antique theatre, Ibrab and Susandaa castles. The Dalyan region is not the last site in Köycegiz to offer natural beauty. The Gulf of Gocek, with its many bays facing numerous islets is another spot. Holding a lovely marina, it constitutes a perfect center for sailing, and here there are also the ruins of the ancient city of Arymaxa, furnishing a different scenery. Sultaniye Thermal Springs (on the south side of the lake) are one of the most important spa waters in Europe and the world, for its higher mineral content, and rich radioactivity. Kulak, Gedova and Yuvarlak Cayi are naturally attractive places with picnicking and camping facilities. The reputation of Bodrum's boatyards dates back to ancient times, and today, craftsmen still build the traditional yachts: the tirhandil with a pointed bow and stern, and the gulette with a broad beam and rounded stern. The latter, especially, are used on excursions and pleasure trips, and in the annual October Cup Race. 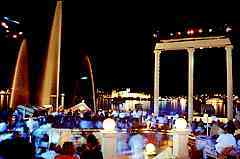 Bodrum, known in ancient times as Halicarnassus, was the birthplace of Heredotus and the site of King Mausolus's Tomb (4th century B.C. ), one of the Seven Wonders of the Ancient World. In the harbour, the Bodrum Castle, or the medieval castle of St. Peter, is a fine example of 15th-century crusader architecture, and has been converted into the Museum of Underwater Archeology, with remains dating as far back as the Bronze Age. The stunning panoramic view from Göktepe, nearby, is much photographed by visitors to the Museums' second-century theater.